Istros is due to be relaunched in mid-2020. 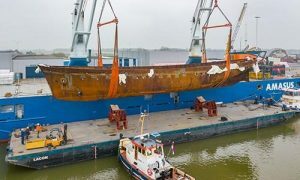 Dutch shipyard Feadship is set to completely rebuild 42-metre (138-foot) classic motoryacht Istros. Built in 1954 by Amsterdam yard De Vries Lentsch and previously regarded as one of the largest superyachts to be built in the Netherlands, the yacht is now undergoing a total refit at Feadship’s facility. Istros, meaning ‘inspiration’, featured an advanced radar system and on-board telephone, which was a rarity at the time. H2 Yacht Design and Laurent Giles Naval Architects made a first attempt to restore the yacht in 2013, but the project was rejected due to lack of funding. Under new ownership, the current rebuild project began last year with the removal of the superstructure and reconditioning of the hull at a shipyard in Malta. The yacht has since arrived back in the Netherlands. A new engine room will also be constructed for two C18 engines, a C4.4 diesel generator and a Capstone DC560 gas turbine generator. Feadship has grand plans to restore the yacht’s original glamorous aesthetic from its currently rusty hull. The combination of old and new features will be impeccably incorporated into the superyacht’s interior. The yard has worked directly with the yacht owner in order to create a vessel that is family-orientated and child-friendly, perfect for charter use.